Donald Trump’s economic and business policies are coming under fire at a time when his campaign appears to be falling further behind presumptive Democratic nominee Hillary Clinton. “Under the scenario in which all his stated policies become law in the manner proposed, the economy suffers a lengthy recession and is smaller at the end of his four-year term than when he took office,” Mark Zandi, Moody’s chief economist and a former adviser to Sen. John McCain’s 2008 presidential campaign, wrote in the report. The Trump campaign hit back at the report Tuesday, noting that Zandi has donated to Clinton’s 2016 presidential campaign and that he had advised the Obama administration on its stimulus and mortgage-restructuring proposals. 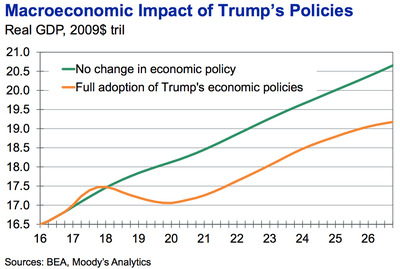 Zandi and his team analysed a number of scenarios — all of the presumptive Republican nominees policies being passed as he has stated them, a few being passed, and watered-down versions being passed in Congress — but each scenario ended with an underperforming economy, according to Moody’s analysis. “The upshot of Mr. Trump’s economic policy positions under almost any scenario is that the US economy will be more isolated and diminished,” the report said. 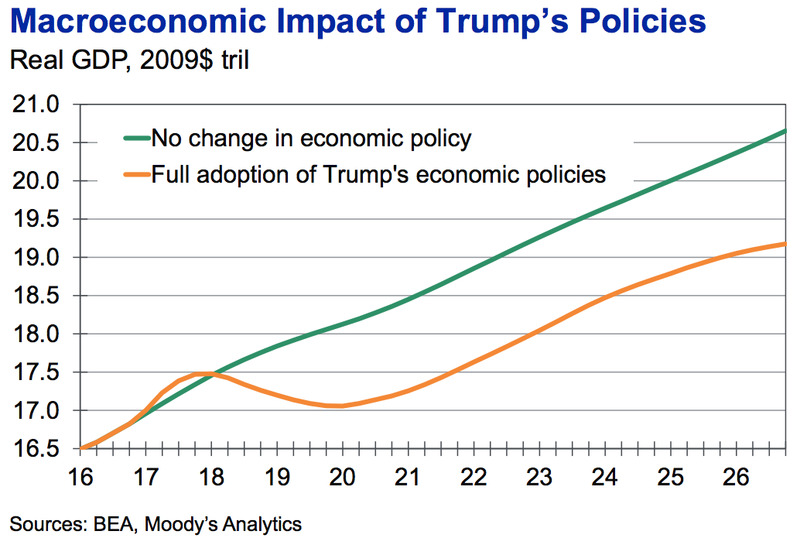 Nearly every proposal that Trump has made, from his tax proposal to his plan to deport 11 million immigrants living in the country illegally, led to a lower estimate of GDP in the Moody’s model. The lowering of the tax rate: Without the tax revenue, Zandi expects the deficit would expand to more than $9 trillion over the next 10 years. This would in turn lead to curtailing of investment from the public sector in economically beneficial programs. Additionally, this would affect households. “Businesses’ cost of capital and households’ borrowing costs are much higher, despite the lower marginal rates, which act as a corrosive on investment and ultimately on productivity and GDP growth,” the report said. The deportation of immigrants living in the US illegally: This would act as a “supply shock” for the labour market pushing up labour costs, crushing corporate margins, and force businesses to raise prices dramatically. “The tight job market and higher inflation prompts the Federal Reserve to normalize interest rates quickly, and then to push rates above their long-run equilibrium,” the Moody’s report read. This is not the first report to examine the potential issues with Trump’s economic proposals. International trade, immigration, and debt plans have all been critiqued by economists and economic observers. In addition to the economic critique from Moody’s, rival Hillary Clinton is preparing to take aim at Trump’s economic policies. On Tuesday, the presumptive Democratic nominee plans to hit Trump on economics and business during a speech in Columbus, Ohio. In conjunction with the speech, Clinton’s campaign also rolled out a website attacking Trump’s business record — titled “Art of the Steal” — which went after everything from his failed Atlantic City casino business to his ability to grow his wealth compared to a basic index fund.